Experimental medium tank. The A-32 and A-20 were developed and put on trials at the same time. 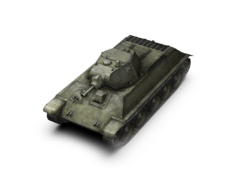 The A-32 was adopted for service and evolved into the T-34. A-32 has similar mobility to the A-20, with extra add on of the +15mm of Frontal hull armor, and +10mm of side hull armor. The Turret also has an extra +10mm of armor in contrast to the A-20. This can make a significant change in defensive tactics if used properly. The A-32's main distinction is the 76mm L-10U, which is a short barreled "Derp Gun". This cannon can wreck some serious havok on the opponent if used in a proper manner. The drawbacks to this high alpha power, would be the long reload and very long aiming time. which contrasts entirely to the similar A-20's low alpha, quick firing rate guns. Due to the Thicker armor(although , keep in mind, only by mere mm) A-32 required a bigger engine, and therefore has a higher Horsepower. Although , this comes with the drawback of the slower traverse speed. 40 degrees for both turret and tracks.Due to the tank being classified as a medium tank, it has gained the status of being the fastest medium in the mobile platform to date. This tank also receives preferential matchmaking. A-32 plays like an A-20 would, with the exception of the derp( high alpha, long reload ) gun. Due to this, suggestions would be to flank the enemy, and use the speed to get around the enemy tanks and pound he, heat, or ap shells into their weaker armor. If you are being attacked, this tank performs well at angling it's armor against an obstacle, due to the sloped frontal armor, and the 35mm of upper glacis plate armor. You should always keep this tank moving, or angling, because that is where it performs at its best. This page was last modified on 4 September 2015, at 04:04.